We own several large industrial properties significant to their areas, and develop them for new uses in compliance with the principles of sustainability. Our aim is to provide our customers with facility and concept solutions that meet their needs for premises in a developing urban environment. We cooperate with cities, municipalities and various authorities in the development work. We have a total of approximately 338,000 square metres of leasable floor area and approximately 320,000 square metres of unused building rights. The Asko area is the largest Renor project in terms of area. It is part of the Lahti centre district, and the Asko area is included in the City of Lahti’s and its neighbouring municipalities’ extensive railside development project. 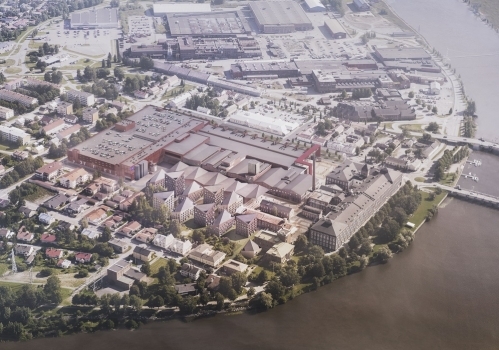 The investment potential of the area, worth EUR 600–700 million, makes the area one of the most interesting area construction projects in the Lahti region. Renor has found new uses for the historic industrial properties in the area. In recent years, the area has grown into the most versatile hub of business in the Lahti area. Over 300 specialist, commercial, service, logistics and manufacturing companies operate in the area. Together, they employ approximately 2,500 people. Because there are diverse service and premises opportunities available, both locally and nationally operating companies have moved into the area. This is also supported by its location: the area is connected to diverse private and public transport services in and outside Lahti. 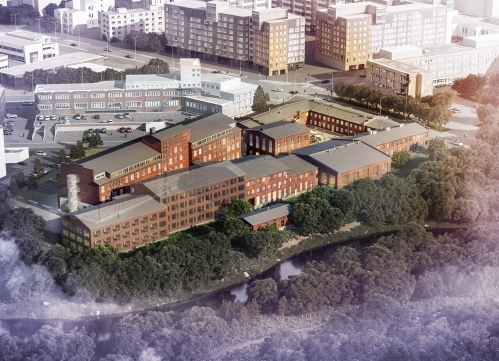 The Asko area is currently comprised of six properties: Asko 1, Askotalo building, Koy Lahden Teollisuuskeskus, Upotalo building, Upo2 and Koy Lahden Liesitehdas. In addition, the first detailed plan allowing housing was confirmed for the Asko area in August 2017. It covers approximately 80,000 square metres of building rights for housing, as well as retail and office premises. The detailed plan includes approximately 40,000 square metres of residential construction and almost the same amount of building rights for retail and office buildings.The planned area is bounded by the Askonkatu junction in the west and the Upo bridge in the east. 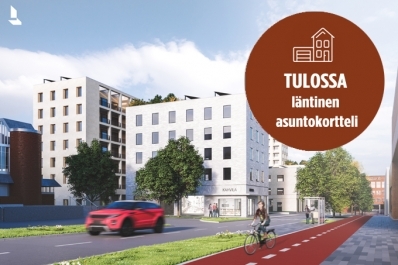 The first residential building will be constructed on the western Asko area residential block at the corner of Askonkatu and Mannerheiminkatu. The construction will begin in March 2019 and the residents will move into their new homes in May 2020. The eight-storey building will have 37 apartments, which include everything from studio to three-room apartments. Touko Capital will be responsible for the property’s construction and apartment sales. The property’s construction work will be done by Rakennustoimisto Valve Oy. The area in the detailed plan is bounded by the Askonkatu junction in the west and Askotalo building in the east. The confirmed detailed plan includes approximately 15,000 square metres of residential construction. Construction of the first residential building will begin in March 2019 and the homes will be ready for residents in May 2020. The eight-storey building will have 37 apartments, which include everything from studio to three-room apartments. Touko Capital will be responsible for the property’s construction and apartment sales. The property’s construction work will be done by Rakennustoimisto Valve Oy. The area suits a 2,000-square-metre grocery shop with store front premises, serving the nearby area and the nearby Lahti travel centre. In addition, approximately 1,000 square metres of other local services are being planned. The area covered by the detailed plan could suit a single, large company’s main location or an office building housing several companies. The permitted building volume in the area is 6,700 m2 + 6,700 m2, a total of 13,400 square metres on the two lots. We pay particular attention to energy efficiency in our operations and have focused extensively on the utilisation of renewable energy sources. We systematically develop and certify our properties. The Askotalo building in Lahti has been awarded the BREEAM In-Use good-level environmental certificate. The entire Asko area utilises renewable energy sources extensively: a groundwater system is used for cooling thousands of square metres of offices, restaurants and lobbies. The electricity consumption is approximately 30–50 per cent smaller compared to premises equipped with traditional cooling. This corresponds to the average consumption of electricity of approximately 13 single-family houses. The efficiency of geothermal energy production was increased in summer 2018 by drilling a new well near the old one. This is the first geothermal energy system of considerable size to utilise groundwater in Finland. Its power is 0.3 MW. When completed, the wells will form a coupled system, and they can be used as a genuine ATES (aquifer thermal energy storage) system. The current water supply of 600 cubic metres a day will increase to 1,000 cubic metres. Through this, the monthly heating capacity will be increased from 100 megawatt hours to approximately 160 megawatt hours. The Puuvilla city block in the Isosanta district in Pori, on the shore of the Kokemäenjoki river, is comprised of the Puuvilla shopping centre and other buildings in the block, the most significant of which are the old spinning mill and head office. The Puuvilla properties are owned by the mutual real estate company Porin Puuvilla Oy. Porin Puuvilla Oy is owned by Renor and Ilmarinen in equal shares. The city block is divided into the Puuvilla Business Park with offices, education and diverse service facilities and the Puuvilla shopping centre. Its versatility guarantees the financial preconditions and good services for continued development. The Puuvilla Business Park has become a significant hub of business, administration, science and culture in the area. Thanks to its central location, it attracts a great many operators from diverse fields to the area. The Puuvilla shopping centre opened in November 2014. It has seen record-breaking annual growth in visitors and sales. In 2016, there were over 5.3 million visitors to the shopping centre, up approximately 11% year-on-year. Total sales increased by approximately 11% during the same time. 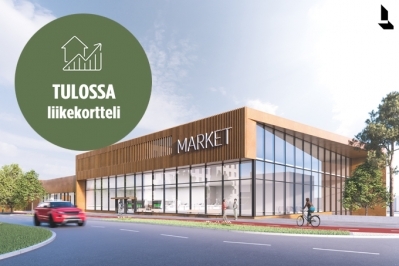 Puuvilla has become the biggest business and education hub in Satakunta, with local and national businesses and organisations operating there in addition to the shopping centre tenants. The Puuvilla area is one of the built-up urban environments of national significance listed by the National Board of Antiquities. The city block has 69,000 square metres of unused building rights. The new plan for the area would allow the construction of a residential area of 20,000 square metres and expansion of the shopping centre by 6,000 square metres. The Puuvilla shopping centre has been awarded the Platinum LEED environmental certification. Underlying this is the sustainable development of the existing block, which has been the starting point since renewal of the property began. Currently, geothermal energy accounts for over 98% of the heating and cooling energy required annually. In fact, geothermal energy has been used for cooling and heating the property at Puuvilla from day one. In spring 2017, one of Finland’s largest property-specific solar power plants was taken into use in the shopping centre. Now, the 2,226 solar panels annually produce approximately 534,000 kWh of solar power. This corresponds to the annual electricity consumption of 266 apartments in a block of flats. There are environmentally-friendly options available for visitors as well: the parking garage features charging points for electric vehicles. Tikkurilan Silkki is a city block undergoing renewal in the centre of Tikkurila, Vantaa, within walking distance of the busy Tikkurila train station. The investment into the renewal of Tikkurilan Silkki amounts to approximately EUR 13 million in the first phase. In addition to the construction of 5,000 square metres of office premises, this includes a parking facility for approximately 175 cars and a geothermal power plant for the entire block. These projects will be completed around the turn of the year 2018–2019. There will also be a residential building in the block on the park-like shore of the Keravanjoki river. Skanska Kodit is responsible for its planning and construction. The aim of Silkki’s second phase is to construct the block’s multi-purpose, restaurant and service premises. The service premises may also include office and retail premises. 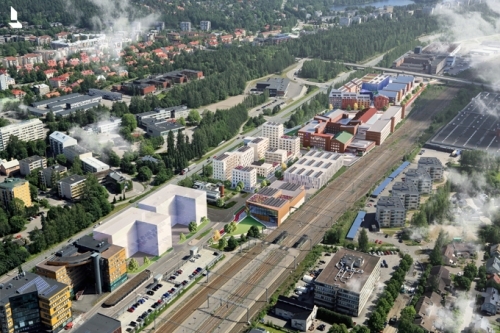 Silkki will become the most beautiful city block in Vantaa, with jobs and homes as well as service, restaurant and multi-purpose premises around the same yard.